(Bloomberg Opinion) -- JA Solar Holdings Co. is going home, where the sun’s shining. The Chinese maker of solar modules will soon go public in Shenzhen via a $1.1 billion backdoor listing, only six months after taking itself private in the U.S. Following a disappointing 2018, solar stocks are on a tear. Beijing is starting to see solar panel makers as national champions. The country’s solar exports to the U.S. plunged last year after President Donald Trump slapped a 30 percent tariff on Chinese manufacturers. 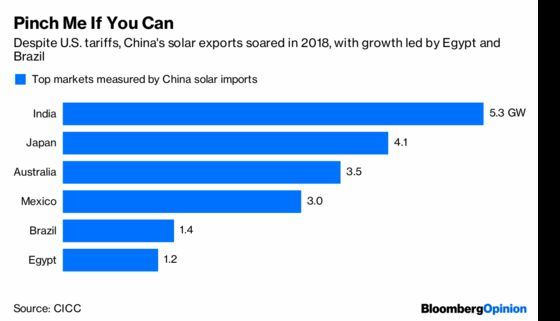 But escalating trade tensions haven’t stopped China Inc.’s overall solar shipments from soaring. In the first 10 months of 2018, exports rose 34 percent from a year earlier. Whereas China is seen as years behind the U.S. in making memory chips, Beijing can congratulate itself on leading in solar. Along the entire value chain, the country is now the dominant producer, owning as much as 90 percent of global manufacturing capacity in certain segments. In addition, thanks to the government’s Top Runner program, Chinese companies are ahead in high-efficiency solar technologies such as passivated emitter and rear contact, or PERC, cells and bifacial modules, says Bloomberg NEF solar analyst Yali Jiang. A closed door to the U.S. is no problem. China Inc. can build solar farms in Egypt and Brazil instead. Producers such as JinkoSolar Holding Co. have a long established presence in emerging markets. Plus, with its solar industry withering, the European Union ended trade controls on Chinese makers last September. Seeing communications equipment maker Huawei Technologies Co. shut out of one country after another, Beijing won’t let its solar babies drown, despite the hefty subsidy bills it’s been paying. The National Development and Reform Commission said this month that wind and solar plants can win long-term power purchase agreements at fixed tariffs with government-run grids as long as they charge no more than coal-fired plants, a policy known as grid parity. Policy support is a big deal for solar companies. Grid parity can be reached as soon as 2020, according to UBS Group AG, which says the China market is big enough to host more than 1,000 gigawatts of solar installation by 2045, compared with the current 165 gigawatts. The NDRC statement was the catalyst for solar stocks to rally. Shanghai-listed Longi Green Energy Technology Co., the world’s largest maker of mono-silicon wafers, is up 27 percent this year, even after a recent profit warning. But like the wind, China’s policy directives can change direction quickly. After all, it was only last May that the government unexpectedly cut solar subsidies. 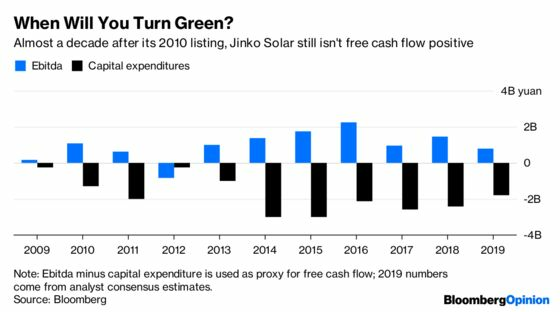 When policy support is gone, what’s left is long-held, deep skepticism among investors over whether the economics can ever work for Chinese solar manufacturers. Look at JinkoSolar, which generated $3.9 billion of revenue last year from sales in more than 80 countries. It’s still expected to bleed $140 million in free cash flow this year. JA Solar’s filing with the Shenzhen Stock Exchange shows that it flipped to a loss in the first nine months of 2018. As soon as government subsidies are cut, heavily indebted solar manufacturers become distressed. 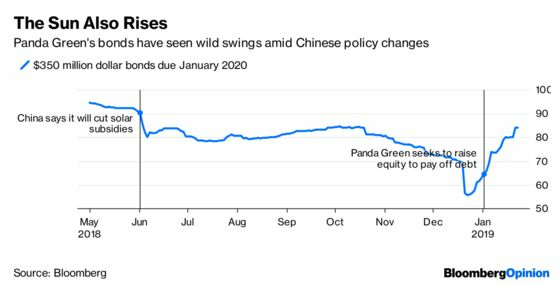 China Singyes Solar Technologies Holdings Ltd. defaulted on a $160 million bond in October, while Panda Green Energy Group Ltd.’s dollar note due in a year is offering a 25 percent yield over-the-counter. U.S. investors have seen enough of these roller-coaster rides. 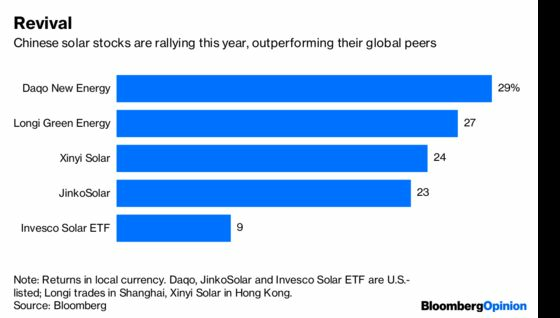 The Invesco Solar ETF, for instance, still has almost 30 percent of its holdings in Chinese producers. Back in May 2015, the ETF had a 12 percent weighting in one stock alone — Hong Kong-listed Hanergy Thin Film Power Group Ltd., whose shares infamously plunged 47 percent in one day. The likes of New York-listed JinkoSolar and Daqo New Energy Corp. are trading at well below book value. With solar stocks still a rarity in China, JA Solar will probably be well received, at least initially. Chinese investors will soon find out that the sun always sets, and companies that live off policy dividends have no sustainable source of earnings power. By comparison, Qihoo 360 Technology Co. had to wait a year and a half before listing via the backdoor last February.